Thanks to the generosity of my supporters at Patreon, I am re-releasing edited versions of my early novellas, Fly By Night and Sacrifice. 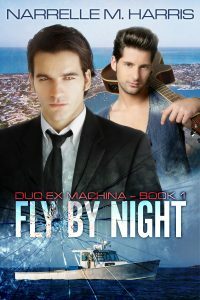 The first, Fly By Night, will soon be re-released with this brand new cover art by Willsin Rowe! In this cover are Frank Capriano, his boyfriend Milo Bertolone, who play music together as Duo Ex Machina. The novella is set in Fremantle, pictured behind them. I can’t tell you the parts played by the cracked glass and the crayfishing boat because Spoilers, sweetie. 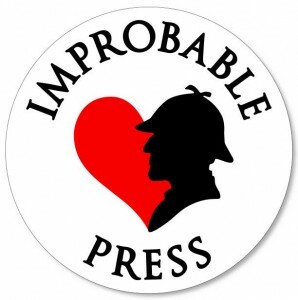 Willsin has previously done wonderful work with my books and stories at Clan Destine Press. His is the marvellous eye behind the covers for Ravenfall, Near Miss and the Secret Agents, Secret Lives series. If you support me at Patreon at the $1 level or above, a copy of Fly By Night will be yours as soon as the e-book files are ready. Otherwise, the book will be officially re-released a week or two later. I’ll make an announcement here when that happens!